The Tank Museum houses the world's largest and finest collection of Armoured Fighting vehicles and one of the largest collections of associated publications. 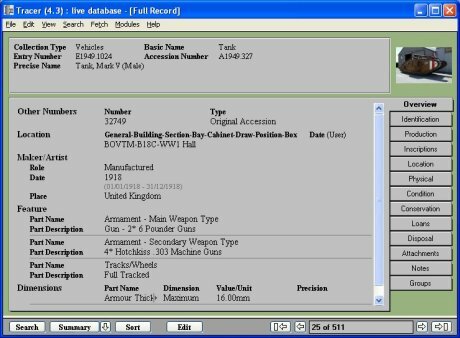 The document archive is equally extensive and includes the archive of War Diaries covering virtually every regiment of the Royal Armoured Corps in the Second World War. The photographic archive is one of the largest of its kind in the world, containing well over 250,000 images. We have configured TRACER, the museum's catalogue system based on MUSIMS, enabling the museum to catalogue its entire collection to international standards. All catalogue records are linked to relevant digital images, audio, video and other resources. Our OAI Harvester links from MUSIMS to enable the museum to take part in a Resource funded project to prototype metasearching via an online portal into a number of disparate digital catalogues. Working closely with the museum we delivered ContentIndex+ integrated with TRACER. This has a narrative facility enabling the museum to create any number of themed presentations from their collections. Using the system, museum staff have developed interactive gallery kiosks providing imaginative access to their collection of medals and making a significant contribution to the 'Citizenship, Community and Courage' initiative.